Dress-to-Impress Author, Pam Powers called into the YarnThing podcast with Marly Bird from California and we appreciate the earlier day for her. With a name like Powers, perhaps she has extra energy earlier in the day? No, that’s too punny. Pam said she began knitting when taught as a child by her grandmother, but didn’t really delve into it until much later when looking for something to do. At that point she felt she had to learn to knit again, but she took to it quickly. It wasn’t long before she was adapting patterns, which she felt was easy for her. Someone asked her about a shawl she was wearing, if the pattern was for sale, and all about Ravelry. Pam went and immediately wrote the shawl’s pattern and posted it for sale. It being her first pattern, she feels now that it was pretty poorly written. She took classes at Stitches West, with teachers like Edie Eckman, Barry Klien and Lily Chin who taught classes on pattern writing and designing. She also found a tech editor that she still uses and feels that in her business that made the biggest assist. Marly asked the impossible question that we all wonder about where Pam finds her creativity. Pam’s response was that it comes to her in a natural way, (as the way Elizabeth Gilbert, author of ‘Eat, Pray, Love’ explains it) inspired from things she sees around her. When she was approached at TNNA about writing a book, she hadn’t thought to put together a book proposal yet, her editor proposed a collection of scarves. Dress-to-Impress: Knitted Scarves (This is the Ravelry link so you can peek at the designs!) includes many different kinds of knitting projects from lace and cable-work, slipped stitches and colorwork, all beautifully photographed. When she began to put the collection together, she started with shapes, so this is not a collection of rectangles, but includes kerchiefs, cowls, ascots… so the pieces in your wardrobe are more like jewelry-type accents and less like utility. The book is available through Amazon, here is the link! If you missed getting to hear this live, it is still archived at this link: http://www.blogtalkradio.com/yarnthing/2015/03/26/dress-to-impress-author-pam-powers or in iTunes. I love to knit all kinds of scarves–lacy, chevron, textured, ruffled. Yours look so beautiful. Again I love the podcast. Pick me! Maybe that works. I have been following Jen’s emails and have one of her patterns in progress using Zealana yarns. However I would like to do one in gradient yarns. Sunshine Yarns in Colorado makes beautiful gradient yarn.. I would love to win Jen’s 2nd shawl book. I have her first one. Bring on the scarves, the cowls, the color work, the infinity loops, the rouching, and of course, let’s not forget the ruffles! This book looks amazing. Loving all the scarves especially the ruffles. Will probably get and order for my library system too. I love ruffles on scarves. Great podcast. I need this book so I can make some beautiful ruffles. I never knit a project with them and this looks like a great place to learn. Ruffled scarves and shawls are not really my style but I do love the look of a classic infinity scarf or cowl. The scarves in Pam’s new book are beautiful. I love ruffles on scarves, it just adds a very pretty extra touch. I’d like to get ruffled by knitting a shawl with ruffles. 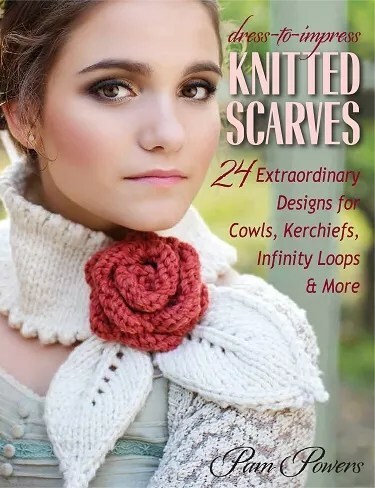 What a great collection of scarves in Pam’s new book. The scarves with ruffles are very pretty! My feathers won’t be ruffled if I don’t win, and I put it on my amazon wish list in case I need to order it. Of course I’ll check the LYS first, I just use the wish list so I don’t forget titles. Wow! Everything in this book is beautiful. The ruffles on the Shirring Cowl are very impressive. Ruffles, bows and embellishments how lovely Pam’s designs are. You both were a joy to listen to. Thanks for a great interview ladies! Pam’s patterns are wonderful. Her ruffled patterns are my favorite. Another great podcast. Pam’s patterns are lovely, and I would not be at all ruffled if I won the giveaway! Congrats to KnittingDaddy for winning the phone-in giveaway again!! Love the scarfes, but hold the ruffles for me. Ruffled scarves are one of my granddaughters favorite accessories…. I love making shawls, ruffles or no ruffles. And there are several of Pam’s patterns that have now been added to my queue and are waiting to be made! Ruffles add a nice feminine flair to scarves, sweaters, etc. Thanks for another great informative podcast! You ruffled my feathers listening to your podcast today! I am always looking for smart scarf patterns, and will defiantly be checking out this book, and designer! Knitting ruffles in a scarf will be a knew technique for me. Looks classy. Thank you! It’s always nice to learn of new designers. Pam’s book looks great. I’m going to have to check her out on ravelry. Let’s see how many ruffled patterns she has!! I find adding ruffles to crocheted scarves and cowls to be so simple when I’m inventing my own patterns. I’m eager to learn about different ways to add knitted ruffles! Just LOVED the podcast with Pam Powers. Thanks Marly! I’m a fan of Pam’s and was delighted that you had her on today’s podcast! Thanks Marly! I’m not a huge fan of “RUFFLES” but if anyone can make “RUFFLES” work it’s Pam! Congrats on the new book Pam! It looks amazing! Love the podcast! And I love me some ruffles! Ruffles on hats, ruffles on scarves, ruffles on garments- I want ruffles on everything! Pam’s designs are gorgeous and love her scarves and shawls, whether with or without ruffles! Really enjoyed this show – and going back through some of my projects/patterns and realizing how many of them are Pam’s. LOVE her clear pattern writing style. Perhaps my next Pam Powers project should include some ruffles?